I recently served as commentator for a roundtable on “Digital History’s Relationship to Human Rights Archives and Data Analysis.” Part of the Spring Spotlights series organized by the Digital History working group at HASTAC, the roundtable brought together five accomplished scholar-practitioners working at the intersection of archives, human rights, and new media. The projects represented a truly impressive sample of regions and themes, and the responses were pragmatic and interesting. Readers can check out the full panel at the link above. I’ve also posted my commentary in full below. Digital Truth. 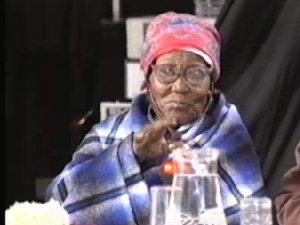 A clip from The South African Truth and Reconciliation Commission Videotape Collection at Yale Law School. Human rights archives, like almost everything else, have exploded online over the past decade. This unprecedented effusion of information is a boon for researchers and activists alike. It also creates new theoretical and methodological challenges unknown to previous generations. Perhaps appropriately, this roundtable exhibits a careful mix of enthusiasm and skepticism. A common thread across all of these responses is the need to step back from “big data” and pay closer attention to context and contingency. Although many of their projects rely on extremely large data sets, the respondents were nearly unanimous on this point. Lu Xiao warns of the temptation “to favor quantitative analysis (e.g., statistical modeling) because aggregation is possible, and because it can be very time consuming to conduct qualitative analysis.” Trudy Peterson calls for greater humility in the face our “Promethean ambitions.” Patrick Stawski suggests closer attention to the political economy of “record making systems.” Pamela Graham asks researchers to remember all of the material “generated outside the reach of the digital.” And Ben Miller seeks to combine “the engagement of personal narrative” with “the precision of big data.” The latter is a worthy standard, I think, and all too rare in digital history projects, which tend to vacillate between these two poles. Another theme that emerges from these replies is the need for effective outreach. The archival projects on display here are tremendously diverse, ranging from East Asia to Europe to Africa, from the Holocaust to the Khmer Rouge to modern NGOs. Yet, as Graham argues, even the most well-preserved records “can be silent if they are not easily found or used.” One way of managing this wealth of material, as Stawski points out, is to improve collaboration between archivists and record-creators. Certainly advances in file sharing technologies, such as cloud storage, will make this task easier in the future. Both Peterson and Miller call for closer dialog between archivists and historians. This is not a luxury, they argue, but a baseline necessity. Peterson would mandate that archivists earn a graduate degree in history. Miller requires what he calls “a transdisciplinary background,” with a special focus on topic modeling and computer science. Yet the amount of time required to master a single discipline, never mind three or four disparate fields, can be enormous. So an even greater degree of communication between specialists is desperately needed. One question I would pose to the respondents is how they envision the relationship between human rights archives and human rights. Or to put it another way – how do human rights activists factor into this discussion? The issues raised here led me to reflect on my own experience helping to launch and grow the Culture of Peace News Network (CPNN). Initiated by UNESCO over a decade ago and continued with the support of the UN General Assembly, CPNN offers a platform for reports and discussion on the global progress of human rights. Public participation, transparency, and interactivity are core values of the network. Long before the rise of Wikipedia, Facebook, or Google, in the heady early days of PHP and MySQL, CPNN was open for user submissions, peer review, and debate. It was arguably among the very first websites to crowdsource its content, many years before that term was invented. Although somewhat dated now, it continues to generate new data. Submissions cover local and regional events and experiences and are especially strong for Africa and Latin America. As of 2012, the site attracts around 100,000 unique visits every year. It is a living, breathing archive. Recent digital history projects, such as the Hurricane Digital Memory Bank, History Harvest, and Legacies of British Slave-ownership, also place special emphasis on public participation and interactivity. This model invites everyone to contribute as an archivist, a curator, or an historian. How will human rights archives of the future engage both human rights activists and the broader public?